Now, ulp, I have one inside my house. How do you say no in the middle of a birthday party when someone says We Have A Present for You, it’s on a truck, how about this corner? Well, you say yes! It’s the Autumnal blazing happiness yellow of sunflowers and pear apples and drowsy honeybees. It’s pettable, and clean, and it comes with its own little tag indicating that it is #4. 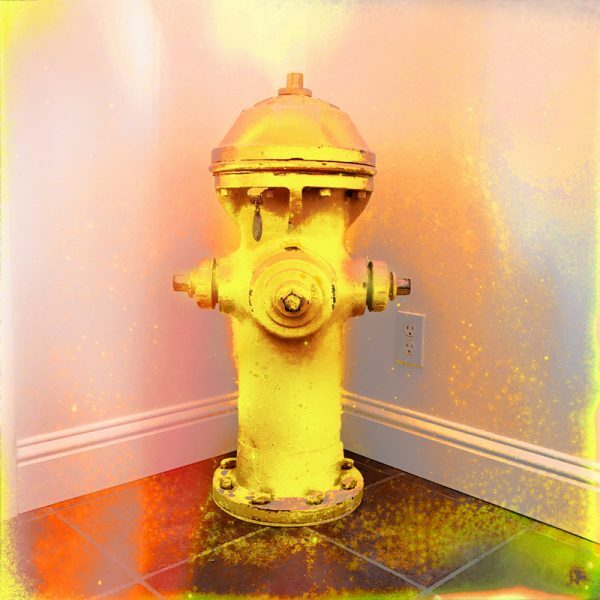 Its presence in my house makes me realize the Heavy Metal Hydrant Suite can’t wait any longer to meet the world. I have been working on this series of prints for quite awhile. 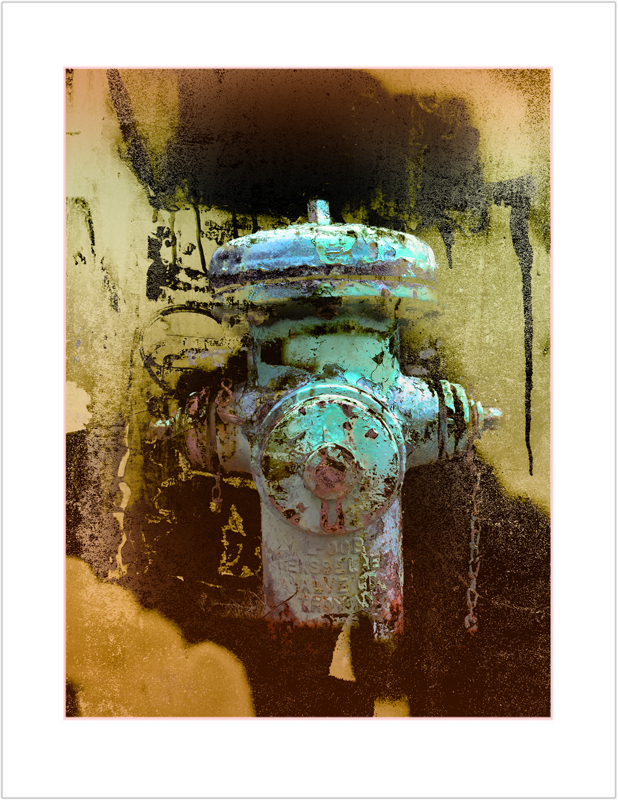 I have approximately 600 photographs of fire hydrants in my files, dating back several decades. This is nothing in terms of commitment compared to the obsessive depth of The Hydrant Museum curated by Fire Hydrant.org. This site, the brainchild of Thomas Ingalsbe, is astonishing. 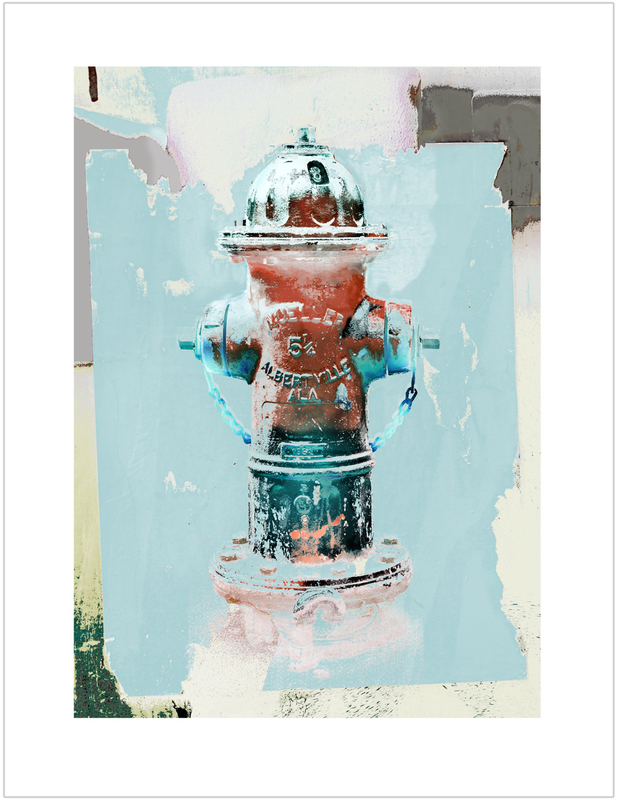 Here you will find archived private collections of fire hydrants, restoration tips, and descriptions of every hydrant imaginable. Behind the scenes, at an undisclosed location behind a berm in a state starting with an A, Mr. Ingalsbe has his own collection of 900 fire hydrants. His website has been a true inspiration, and I am grateful for the kind assistance he has offered with documentation and certain mysteries of manufacture. This series of prints is ongoing, and will be released on my shop over the next few months, starting with this initial set of three. These prints are ideal gifts for the person in your life who stays up ’til three worrying about catastrophe. Also, your local fireman, whether they have saved your cat from a tree or rescued your house from an inferno, or even if you just have a crush on him/her. Start with an offering of art and work up to apple pie, I guarantee you will get their attention. . . . This series is printed in archival inks on fine rag paper in editions of 75, and affordably priced at $175 including shipping. The image size is 12 to 13.5 x 18 inches on a 17 x 22 sheet. 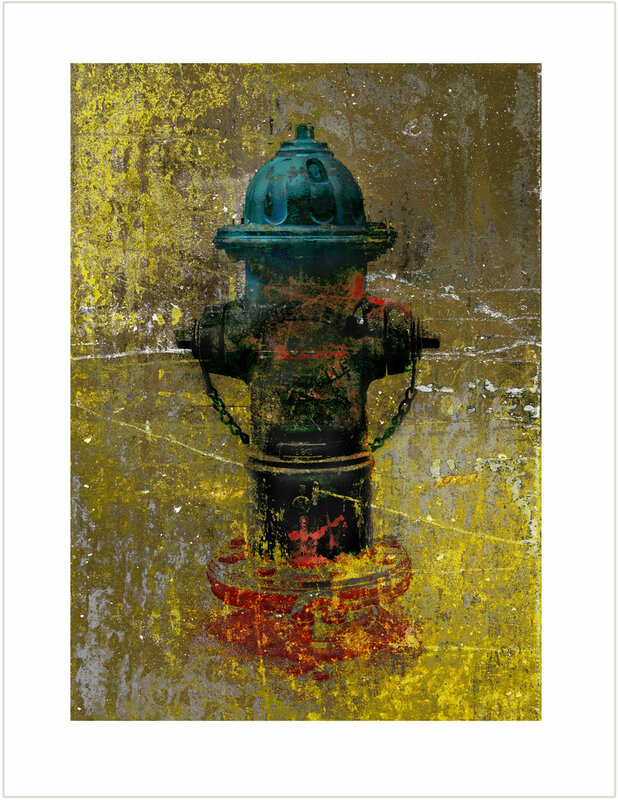 Each piece is composed from my own photography, digitally blended with paint and inspired by the music of the street. Click on the titles below or go to the Hydrant Section of my shop to review details or to purchase. In other news please save the date for Digital Maneuvers, a group show including me, Troy Gua, Kate Sweeney and Stephen Rock at Seattle Art Museum Gallery, opening First Thursday October 4, 6-7:30. My solo show, ColorBath, at SAM’s Taste Restaurant continues through November 5. Open Weds-Sun 11-5 and Thursdays 11-9.